It’s already time for another week-in-review. It hardly seems possible…but I guess since I wrote last week’s review this week (on Monday), it does make this week “seem” a bit shorter. I tend to write a lot about what I’m doing with Miss M (3rd grade), and less about Mr. E (Kindergarten) and Mr. K (age 3.5 — Preschool). I tried to take a few more purposeful pictures of the boys this week! 1. While we occasionally pull out Phonics Pathways for reading practice, these days most of Mr. E’s reading practice comes from easy-to-read books of his choosing. I typically set a timer for 10 minutes. If he wants to keep going after that, great…if not, 10 minutes of practice per day is fine for his age. Lately I’ve not been introducing too many new phonics concepts — we’re mostly just practicing what he has already learned over the past few months and developing greater fluency with those blends and phonograms. 2. Speaking of phonograms and spelling, I invited Mr. E to play Miss M’s spelling game with us (more on that below). He did a great job with writing and spelling cvc words, and a few trickier four letter words and words generally considered sight words (like “the”). Mr. K ignored us while we were playing this game for the most part, but joined in at the end trying his hand at writing a few single letters. He can write some nice vowels, but that’s about it (fine for a 3 year old!). 5. and 6. This week for Math, Mr. E and I went through lessons 17-23 and part of 24 in Right Start B! This kid is just eating up math right now, as fast as I can shovel it in. Almost every day I had to tell him that we had done enough. I think he might do math for an hour or more if I let him! He also sat in on some of Miss M’s math, and was fascinated by the base 10 picture cards I pulled out for a subtraction review with Miss M. He seemed to really be connecting with how those worked. While I don’t know that he has mastered all the concepts in those lessons we covered, I am trying to keep the pace fast lest he get bored (that happened regularly last year when I tried to actually do RS A lessons with him). Mr K often sits with us for math too (even at times I suggest he may go play…but he just sits and absorbs it like a little sponge as often as not!). Lately Mr. K has been asking to “do math too”, so I have been teaching him the Right Start “Yellow is the Sun” song and working with him on knowing quantities 1-5 with beads, tally sticks, etc. 7. I pulled out the Pattern Blocks primarily for Mr. K, but everyone had a good time using them. I think it’s been over a year since we have used these so it was fresh and new! 8. Everyone loves every chance they are given for learning or fun on the iPad. 🙂 Toca Boca Band was a new app this week, and a fave for everyone. 9. Fun table work for the boys to do while I worked with Miss M — From 1+1+1=1 I printed out Animal Alphabet printables for Mr. K (but Mr E wanted some too!) as well as Solar System printables for both boys. History: Most of our work for US History this week consisted of historical fiction reading. Miss M is reading Pocahontas and the Strangers independently. We finished up Puritan Adventure and started the Witch of Blackbird Pond as bedtime read-alouds. 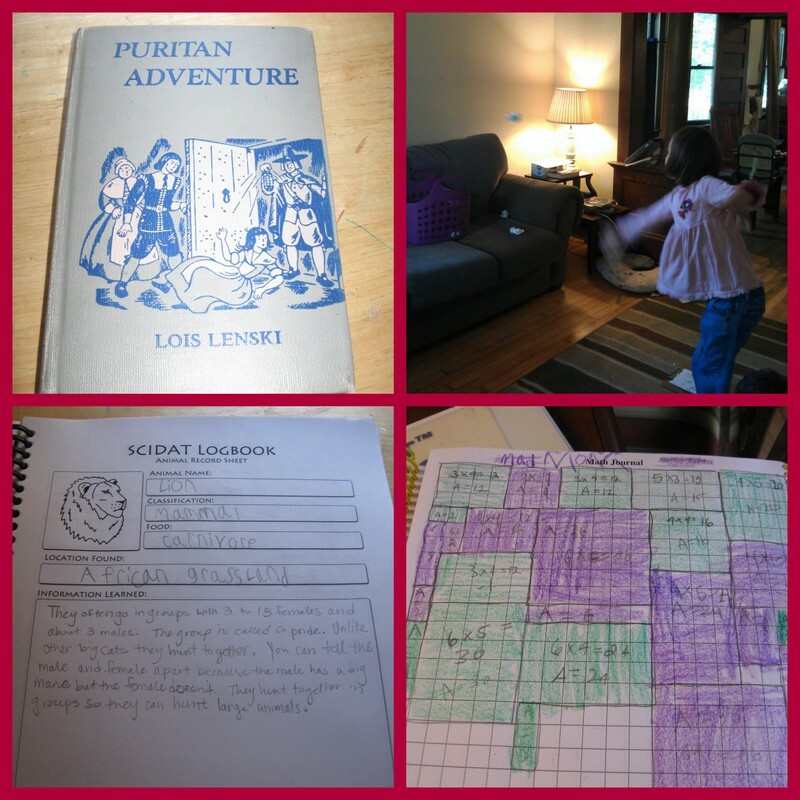 I had really good intentions of doing some notebooking or other projects on paper with Miss M to get on paper some of what she has learned so far about the Pilgrims and other early colonists, but it just didn’t happen. Science: I added Sassafras Science Volume 1: Zoology to our science studies as a program that Miss M can complete mostly independently. A lot of information is conveyed via a story about two kids who go on a trip around the world to learn about various animals and their habitats. This is supplemented with encyclopedia or other readings about the animals and some short notebooking pages. Pictured is Miss M’s notebooking page about Lions. She filled in the top section and narrated the bottom portion to me. Miss M will spend maybe 15 minutes per day on this science program. She likes it so far! Spelling: This was a review week (Lesson 10) for us in Logic of English. Miss M identified from a list a dozen or so words from the last five lessons she felt like she wanted to practice. Miss M’s favorite review and practice activity was Spelling Basketball. I called out the words and she wrote them down on a half sheet of paper. Then she could crumple up the paper and toss it in the basket. One point for every correctly spelled word, plus an extra point if it makes it in the basket! 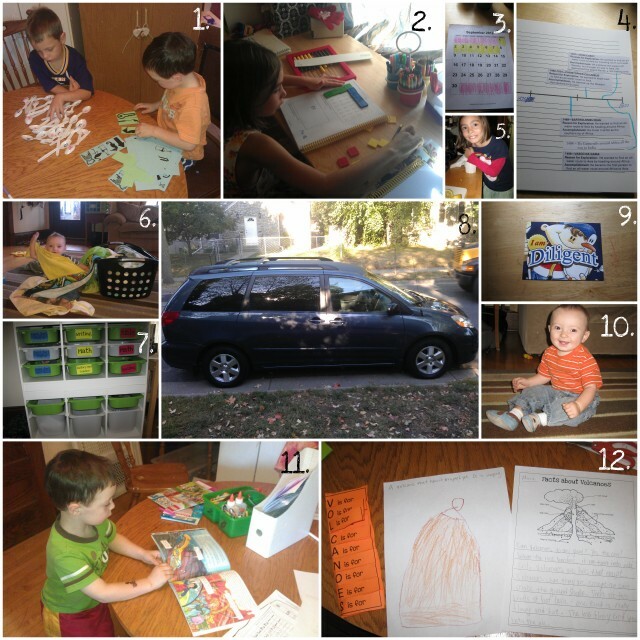 Collage Friday, the Weekly Wrap-Up and Preschool/5K Corner! 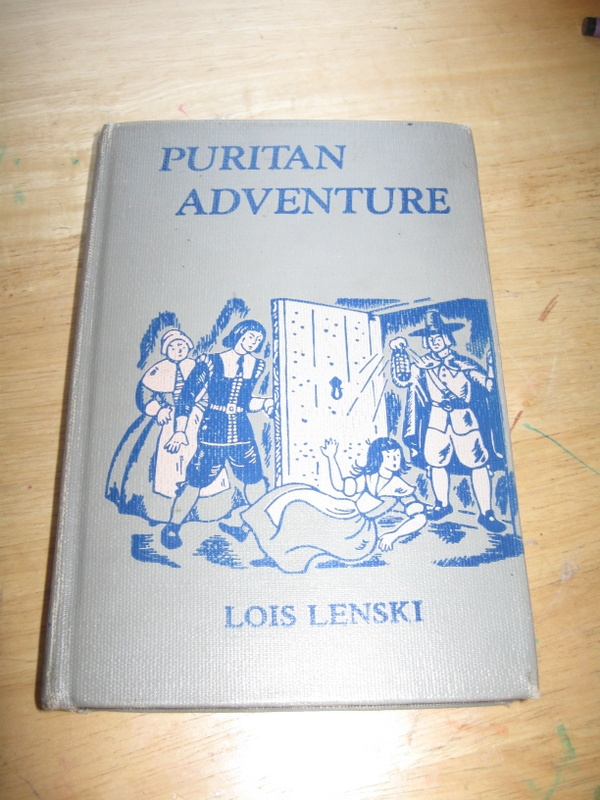 Miss M and I finished reading Puritan Adventure by Lois Lenski earlier this week. This was a title I found via All Through the Ages, a great book for finding suggestions of both fiction and non-fiction read-alouds for any time period. Puritan Adventure takes place in the Massachusetts Bay Colony in 1635. Many historical fiction books I’ve looked at for our history studies take place in the early Jamestown/Plimoth colonial days, or in much later colonial times (after 1700), so I thought this was a nice addition to our list. It’s clear from Lenski’s forward and Bibliography that she put a lot of time into researching this novel. From her research she created an imaginary town to serve as a composite picture of what life in a Puritan settlement might have been like at that time. The story in Puritan Adventure centers around the Partridges, a well-established family in the town. Goodwife Partridge’s sister Charity comes to join them in New England. She is a young widow, and it’s clear almost from the beginning of the story that she has not come because she shares the convictions of the Puritans in the colony. Not that she is not God-fearing — but austerity, sobriety and plain clothing are clearly not her way of life. 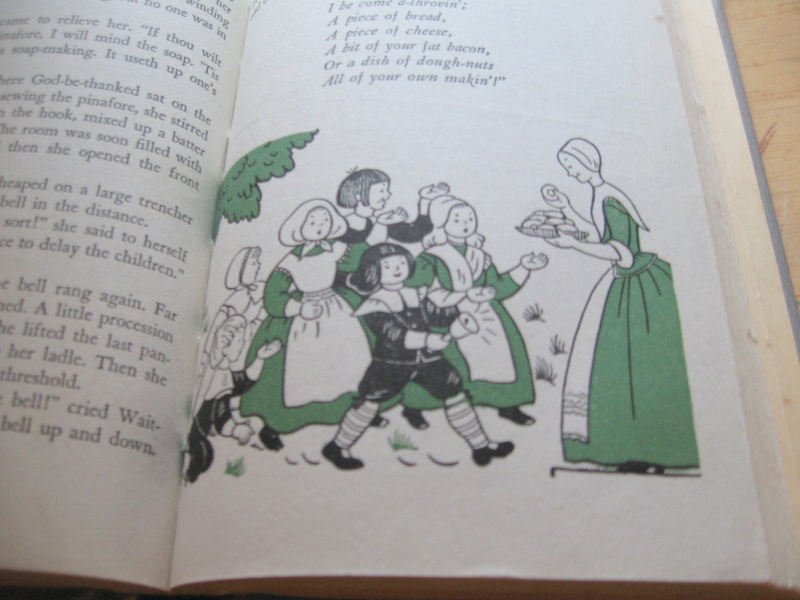 While adjusting to life in the new world, Aunty Charity tries to also bring the best of Old England to the new — Christmas-keeping and going “a-shroving” and “a-maying” are strictly forbidden by the colony’s laws, but she manages to find ways to introduce these holidays to the children and bring some joy to their seriously sober lives. Meanwhile, another thread of the story revolves around Patty Tucker, a servant girl and “redemptioner” — aka someone who is “paying off” the cost of her voyage to the new world by working as a servant for a required number of years. Goody Lumpkin, Patty’s mistress, is cruel, leading Patty to be a poor servant in return. 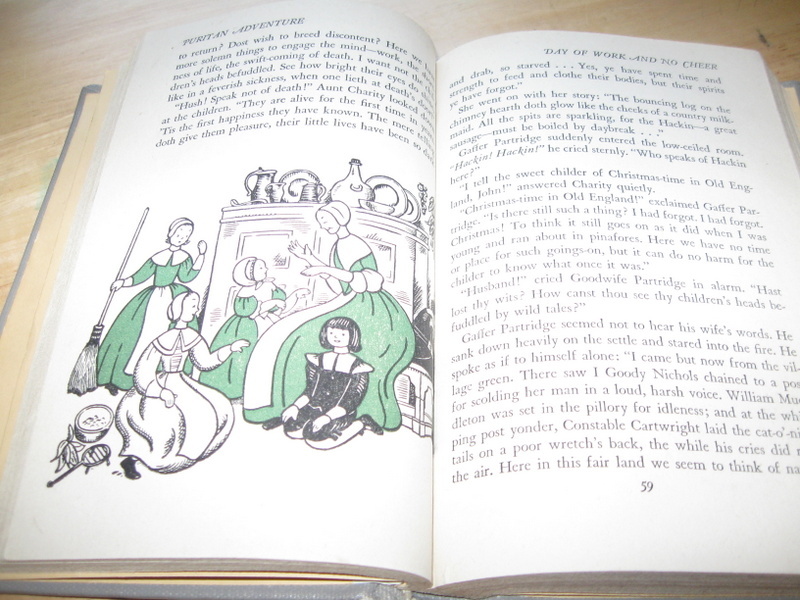 Like Aunt Charity, Patty is also drawn to sharing some of the joy of Old England with the children of the town. The vague idea I had in my mind of Puritans before reading this story is basically true of many of the townspeople in Lenski’s story. The religious leaders are concerned with everyone following strict rules and regulations to a T. “Tithing men” are assigned to each family (one watches over a few families in the town) to make sure they keep up with the rules. Violators are punished by stocks, pillories or even whipping or ducking (getting dunked under the water!). While definitely a fictional story, Lenski portrays that some may have wavered in their conviction of this way of life. Mothers in the story weep with joy as they see their children celebrating Shrovetide and remember their celebrations of the holiday as a child, while later still being willing to condemn Aunt Charity for passing on the knowledge of these celebrations. And everyone puts up with Aunt Charity’s actions for a surprisingly long time. I recommend this book as an interesting story with a few caveats — the language is a bit difficult to understand at times. Lenski wrote the dialog in the way that the Puritans probably spoke at the time and there are plenty of “ye” and “thee” and other such trappings of early modern English. Miss M seemed to follow the story fairly well despite this (and with a few explanations of word definitions as we went). Lenski also uses some terminolgy to refer to the Native Americans in the story that some may find offensive — such as the use of the word “squaw” and describing the Indian women as “fat” and “waddling” in a few places. I tried my best to skip over some of the more offensive descriptions, which didn’t take much away from the story. Lenski was also not shy about incorporating what was probably a somewhat common way of treating servants at the time — Patty tucker is often whipped and otherwise physically abused by her mistress. Patty’s response to this behavior is held up in contrast to her behavior when treated much more kindly by Aunt Charity and others, so it does provide an interesting point of discussion. Better late than never, I guess. 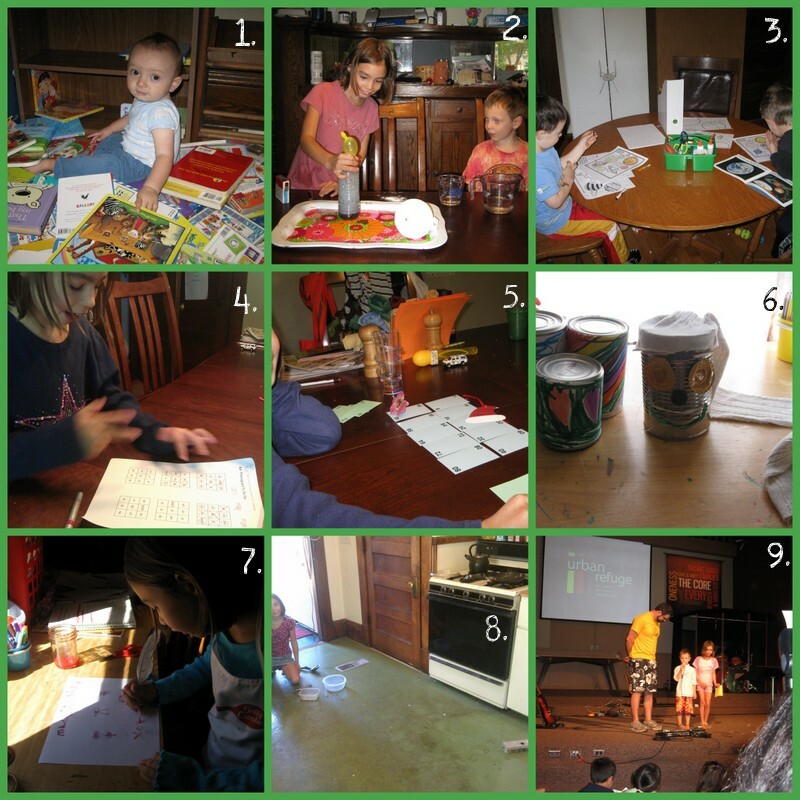 Despite the fact that it is Monday morning right now and we are about to embark on a brand-new school week, I wanted to still post a weekly wrap-up…so if nothing else I can remember what we did this week. 1. Last weekend I re-arranged some of the kids’ books. Now at least when Baby J does this while we are doing school, it is mostly board books he is pulling off the shelf! 2. Miss M wanted to be a “mad scientist”, and put on a “show” for us involving science demonstrations she had seen at a birthday party. Not to be outdone, Mr. E also made a great concoction that ended up looking at bit like a slimy green volcano. 3. Volcanoes are so last week…as of the middle of this past week, space is the boys’ new science obsession. Ever quick to the printer, I found them some coloring sheets and a printable book. Then daddy even let everyone stay up late and he took them outside star-gazing on Friday night. (Well, as good as one can do in the middle of the city!). I often miss taking pictures of the Kindergarten work that Mr. E is doing, but we also practiced writing lower case letters, and he practiced ten minutes of reading each day. 5. It was a big week for RightStart math games as well. In this picture we are playing a multiplication game called “Who’s on Top?” Miss M and I both liked this one. Some RightStart games do turn out to be boring or confusing. We tried one called “Multiple Authors” earlier in the week, and we were pretty confused! Miss M completed 117-120 in Right Start C. Mr. E is still sailing along through Right Start B’s early lessons. We did lessons 13-16, including playing Go to the Dump and Memory to find pairs that equal 10. I am amazed that he seems to already have 10 partitions fairly well memorized! 6. Recycled art this week — a “can Rapunzel” and a “can drum” made by Miss M. The boys made can robots (all of this Miss M’s suggestion and leading…I love that she can lead the boys in crafts! ), but I think they broke/lost them from rough play soon after they were made! 7. Miss M read many books from our history book basket this week (some I assigned, some she read on her own time, even on Saturday!). I also “assigned” her to pick an activity to try from one of the activity books I picked out for this unit. She waited until I could buy strawberries, then made her own “Berry Ink” and wrote with a homemade quill pen (made from a feather we found this summer). Very cool! 8. Miss M and I channeled our inner pioneer women and scrubbed the floor by hand on Saturday. I really spent almost all afternoon at it on Saturday! We rent an old house with an old, old floor that never looked clean even after I mopped it. I have known for a while that I really needed to put some elbow grease into it and scrub out the ground in dirt. The floor is now several shades lighter in color even than what it looked like when we moved into this house three years ago! 9. In many ways, most exciting of all was our Sunday morning. Miss M and Mr. E both decided a week or two ago that they wanted to get baptized! Both have placed their faith in Christ and having seen others at our church get baptized, they wanted to take this step as well. We studied verses on baptism this week and they took this step of faith and obedience on Sunday. We are so proud of them and happy for the chance they have to grow up learning to obey God from a young age. I hope your weekend was wonderful and that you are ready for a new week! As we were wrapping up our unit on Native Americans and Explorers last week, we needed a new read aloud. We stopped our last one mid-way through due to boredom. I pulled out a couple of books for our next topic (early settlers/colonists) and a couple non-history-related read-alouds and let Miss M pick. She picked Margaret Pumphrey’s Pilgrim Stories, revised and expanded by Elvajean Hall. It’s this edition on amazon. Apparently there are at least a couple modern revisions/expansions of this 1910 work available. I can’t compare this edition to the others since I don’t have any of those on hand. This wasn’t a book that I originally had on my American History book list. However when I saw it at the Half Price books tent sale for a buck, it was a no-brainer to pick it up. There is no shortage of books about the pilgrims. Without much effort, I feel like half our history book basket is about Pilgrims, the Mayflower or the first Thanksgiving. Margaret Pumphrey’s Pilgrim Stories turned out to be a fine opening for our studies on this topic. It’s a fairly easy-to-read chapter book with 17 short chapters. I could have very easily handed it over to Miss M for her to read herself. But I’m glad I didn’t. The book opens in 1606 with Queen Anne visiting what turns out to be the home of some of the separatists. A young girl gives away the secret that her family worships God not in the official church, but in their own meeting. Soon the separatists are hiding and being even more secretive to avoid capture by the authorities. Their journey takes them to Holland for several years as they pursue religious freedom (I must have slept through that part of elementary school history class – I didn’t know they went to Holland first! ), before they eventually join with many “strangers” to take the journey to the New World. In Pilgrim Stories we learn not only what the Pilgrim mothers and fathers were doing, but what the children were up to also –some making trouble and getting in the way, others being helpful and brave. The book follows the story of the Pilgrims through the first Thanksgiving and the arrival of another ship from England (The Fortune) shortly after. As I put together our reading list for this unit, I noticed that many books leave the story there. I’ve found a lot of books about Jamestown and Plymouth, and then many more books that pick up the story of life in the colonies in the 1700’s. 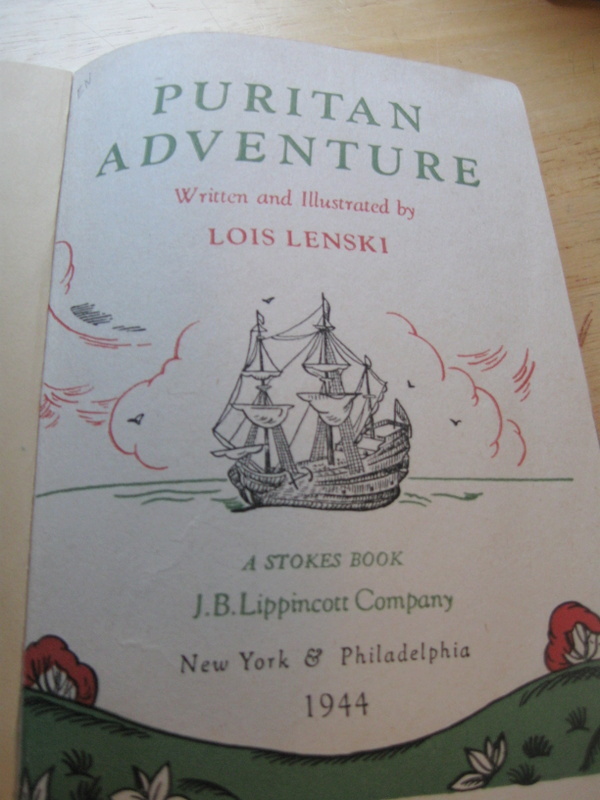 We’re filling in the pieces of what life might have been like in New England about 15 years after the first Pilgrims landed in our next read-aloud: Puritan Adventure by Lois Lenski. 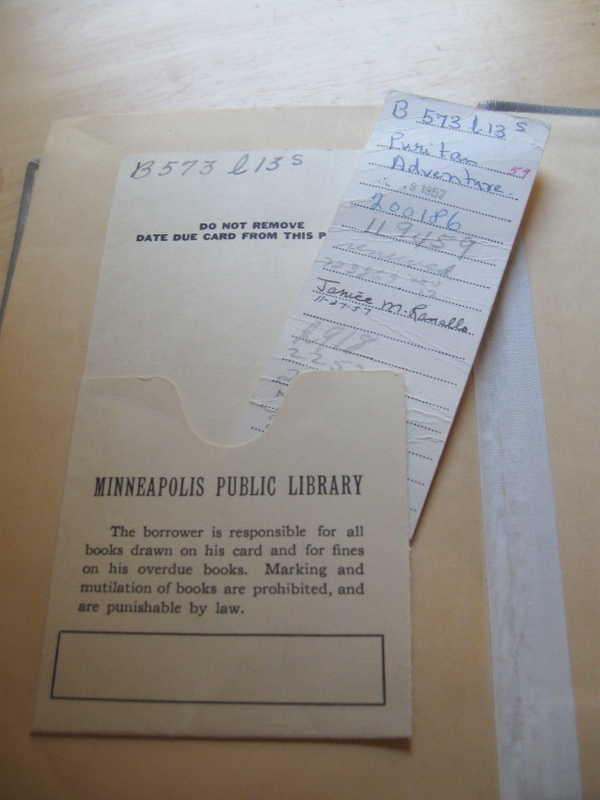 I’m sure I’ll be sharing more about that book for a future Book Discoveries post. Our four days of school had their ups and downs. On the down side, we really still haven’t hit our groove in terms of our schedule. Both Miss M and Mr. E have requested to have their subjects-with-mom first. Sorry guys — you can’t both be first! 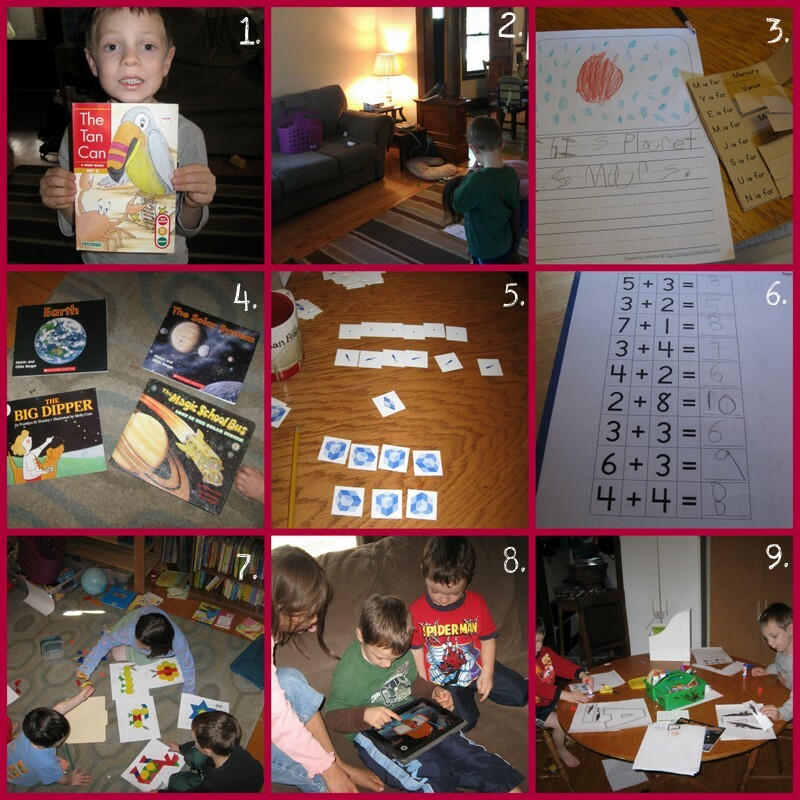 Miss M seems easily distracted by the boys’ fun Preschool and K work and would like to watch or join in…but she also wants to get school done by lunch if possible. After a major meltdown on Wednesday, Miss M let me know that she felt too much time pressure with the first schedule I set up. But today when I tried having a 50 minute block with her to do her “with mom” subjects back to back, Mr. E had really hard time waiting for his turn. I try another schedule iteration on Monday and hopefully we’ll find something soon that works for us. 1. I pulled out some preschool busy bags to help keep the boys busy and quiet during some of Miss M’s work-with-mom time. It worked…a little bit anyway. 2. Miss completed lessons 113-116 in RightStart C — introducing on area, reviewing subtraction strategies and practicing Multiplication. I liked how these lessons were short and sweet. At least they were sweet once subtraction strategies were firmly in the forefront of the student’s mind. 🙂 In other math news, Mr E is breezing through early lessons in RightStart B. 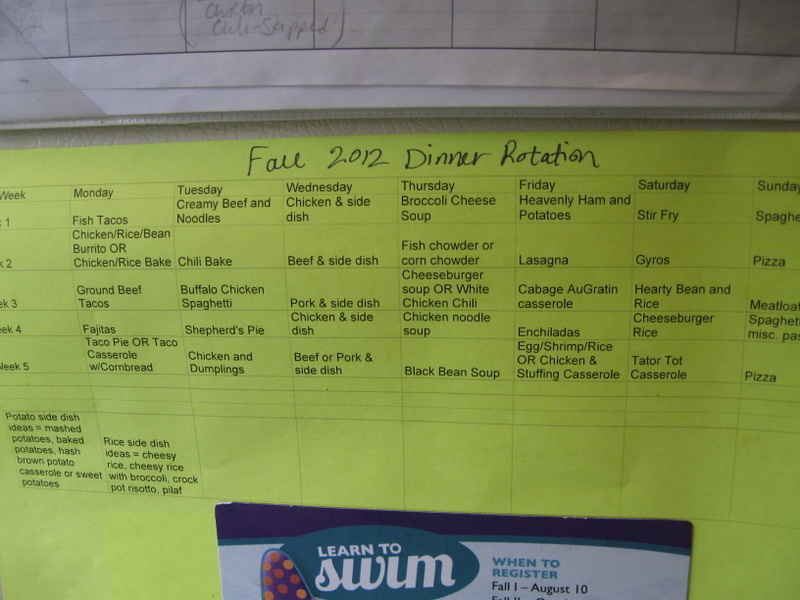 We did portions of RightStart A, but didn’t necessarily go through the program sequentially. So, some is review and some is not. We either reviewed or covered for the first time portions of lessons 4-12! 3. 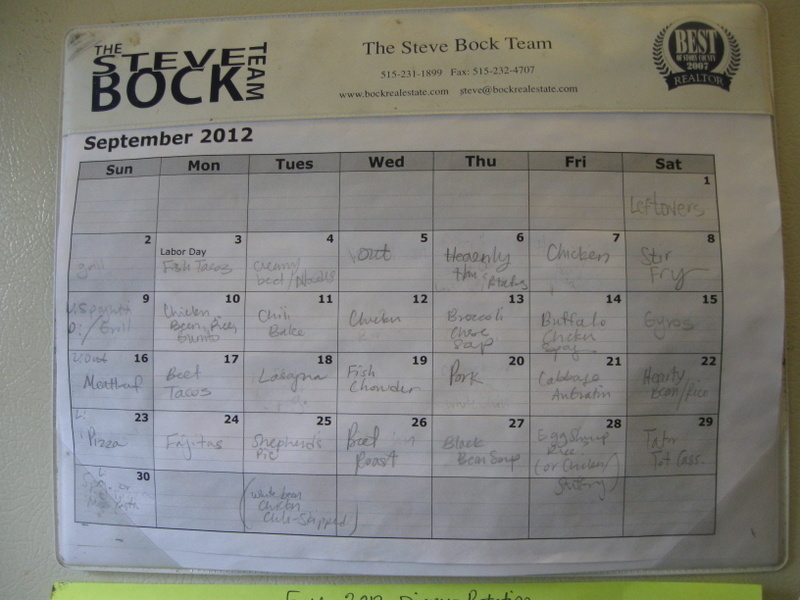 We’re trying some calendar time all together. It’s easy fun/review for Miss M, new and “right on” for something Mr E is ready to learn and a bit above Mr. K’s head. But we’re trying to spend a few minutes on it all together each day. 4. This was a light history week for us. We’re finishing up our unit on American Indians and Explorers by gluing important explorers dates into our timeline book. We already started a read-aloud related to our next unit, and next week we’ll jump in full speed with Settlers/Pilgrims/Colonists. 5. Miss M requested we make homemade lemonade with fresh squeezed lemon juice, since we didn’t get that checked off our summer bucket list. So we enjoyed our lemonade Friday afternoon along with a couple of pastries and had a fun snack/story time. 7. I finally added labels to all our school drawers. Unfortunately, Baby J immediately pulled all the labels off the bottom set of drawers!!! 8. The most exciting thing that happened to us this is week is…we bought a new van!!! After years of saving, we paid cash for a 2007 Toyota Sienna. It is much bigger than the old, tiny mini-van we drove previously. I even fit 12 bags of groceries in the back with room to spare after a big stock-up trip. 9. I purchased a set of the small We Choose Virtues flashcards to try out this program. I’ve read a lot of positive reviews of this program so I was excited to give it a try. We chose “diligent” as our first virtue. So far I am really liking how it motivates the boys and gives them a practical handle on how they can grow in something that is a bit of an abstract concept. Even Mr. K was walking around telling us he was “Diligent Man” while reciting the catchphrase from the card and actually cleaning up his duplos! Yay! 11. – 12. 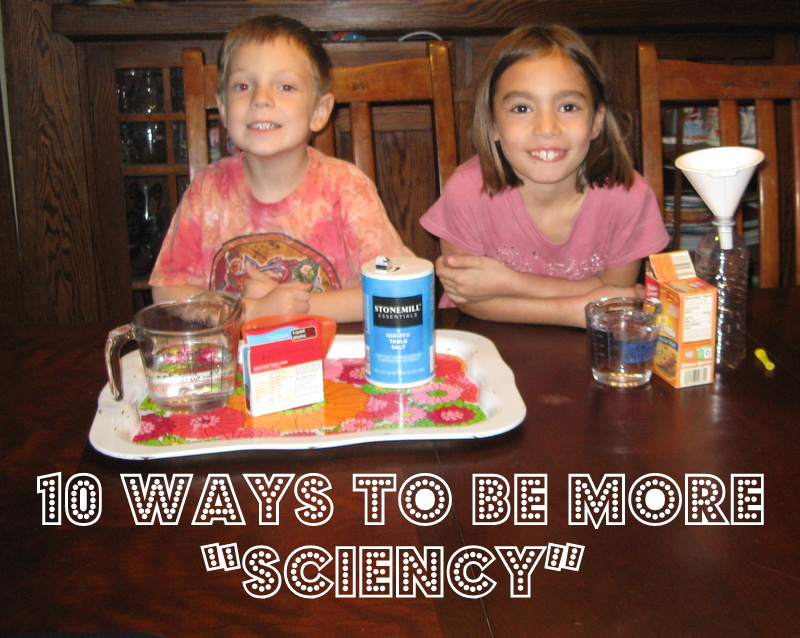 It was a science-y sort of week…both in ways I had planned and ways that I had not planned. Last week we reviewed lesson D-2 (Day, Night and the Earth’s Rotation) in BFSU. This week I had planned to cover lessons D-5 (Time and the Earth’s Turning) and D-6 (Seasonal Changes and the Earth’s Orbit). We did cover, but not finish, portions of both of those lessons. Thanks to inspiration from a library book, the boys begged to study volcanoes. That’s what they are doing in the picture. In #11 Mr. K is perusing a Magic Schoolbus book about volcanoes. #12 shows some of Mr. E’s work — a notebooking page he narrated to me, a drawing and a Hands of a Child lapbook piece from V is for Volcano. We also had a random lesson about how Yo-Yos works after Miss M got a new yo-yo. Thank-you Google for helping me find the answers about questions like this!